Two Toronto landmarks only blocks away from each other are closing soon: the Brunswick House and Honest Ed’s. It’s a sad end to an era. I have fond memories of both these Toronto institutions. I remember scouring Honest Ed’s for bargains as a cash-strapped Ryerson student. Walking into Honest Ed’s was a smorgasbord for the senses. Housewares, clothing and knick knacks were crammed into every nook and cranny of the store, forcing you to walk sideways through the aisles. It was quite the place. And then there was the “Brunny”. The Brunny was the second home for Ryerson and University of Toronto students. We’d stake our spot at one of the Brunny’s long tables after class in the late afternoon. At that time of day, it was just the die-hard regulars drinking and talking. But by night-time, the place became a raucous party, beer hall style. By 11 o’clock, the washrooms had an inch of beer on the floor and there was a line up out the door. You didn’t order beer by the glass at the Brunny. You ordered beer by the tray–$27 for a tray of 30 glasses. Years later, they replaced the trays of glasses with pitchers—it was never quite the same. The best part of the Brunny by far was the entertainment. Carla and Rockin’ Irene, two old birds in their seventies would take to the stage. Irene would belt out old bar and war songs like Roll out the Barrel, and It’s a Long Way to Tipperary while Carla banged away on the piano keys. Nate replaced Carla, and the good times rolled on. Dave and I had our first kiss coming home on the Go-train after a night at the Brunny. I often think I have The Brunswick House to thank for my marriage. 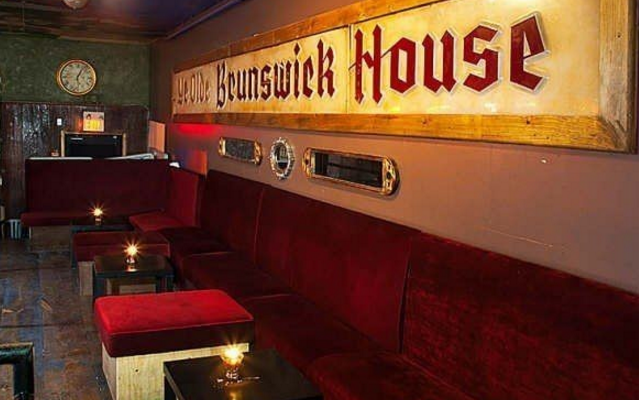 The Brunwick House closes its doors on March 31st. It’s current owner has extended an invitation to all its patrons, past and present over its 140 year history to come for one last drink and to celebrate the Brunny’s last dance. 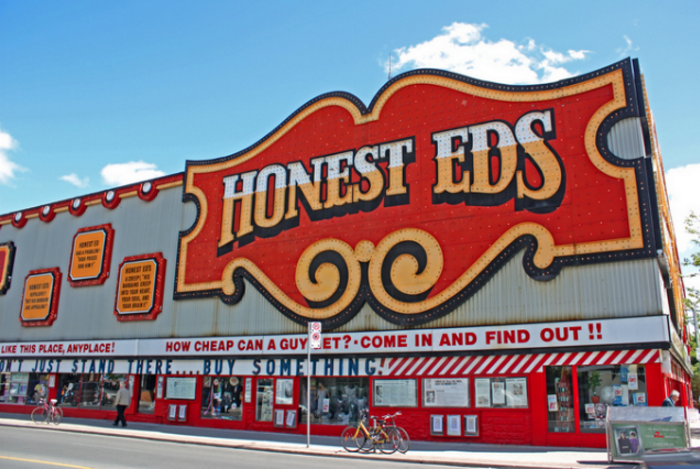 Honest Ed’s will close its doors on December 31, 2016. This week’s #HappyAct is to make a final trek to one of these Toronto iconic institutions. Or leave a comment sharing your favourite memory of Honest Ed’s or The Brunswick House. If we can’t make their final call, we can at least virtually raise our glass in their honour. Cheers to them and to the wonderful memories they gave us.